This article appeared on Mongabay.com on April 12, 2017. To read the article there, click here. After 146 years of operation, Ringling Bros. and Barnum & Bailey is closing its circus, citing dwindling ticket sales. That decline in business reflects a growing sentiment among Americans that circus-style shows involve inappropriate, if not inhumane, treatment of animals, says Julia Gallucci, a primatologist who works with People for the Ethical Treatment of Animals (PETA). That sentiment is not, however, current in many parts of Asia, where certain countries are seeing a rise in circuses and other forms of animal-focused entertainment. A growing number of Asian zoos and safari parks are mounting large-scale productions that feature great apes — with young chimpanzees and orangutans commonly forced to pose with visitors in clownish costumes, or to “ape” human behaviors, dancing and roller skating to entertain audiences. By contrast, Ringling halted its great ape performances in the early 1990s. Training techniques and conditions in captivity at these Asian zoos and parks are raising serious animal welfare concerns, while the illegal trade used to procure endangered great apes for Asian entertainment is a red flag for wildlife conservationists. In theory, Asian zoos and wildlife parks should be able to breed great apes in captivity or legally acquire captive-bred animals from abroad for their shows. But, as evidence reported below suggests, many of the animals appearing in Asian performances have been, and continue to be, illegally snatched from the wild as infants. TRAFFIC, the international wildlife trade monitoring network, recently published a report detailing the demand for apes in wildlife attractions in Peninsular Malaysia and Thailand. It shows that a significant proportion of great apes in these attractions come from the wild or are of unknown origin due to sketchy recordkeeping. The authors found, for instance, that while 57 Thai facilities exhibited 51 orangutans, their studbooks only showed records for 21 of the animals. Likewise, a China-based animal welfare group — that prefers anonymity for the sake of ongoing undercover investigations — believes that the majority of great apes in Chinese animal shows originated in the wild; in fact, some shows even publicize that the chimpanzees they feature began their lives in Africa. Although two Chinese ministries ban the use of animals in circus shows, the animal welfare group has recorded 11 Chinese safari parks or zoos using chimpanzees in performances. Of these, at least six have featured wild-caught chimpanzees. Daniel Stiles manages the Project to End Great Ape Slavery (PEGAS), and has been investigating the great ape trade for four years. He’s made several trips to the Middle East, China and Southeast Asia since 2013, where he’s observed an increase in circus-style shows featuring chimpanzees and orangutans. China’s circus shows are the most sophisticated and large-scale, says Stiles, and they attract massive crowds. Over the recent Chinese New Year, the Chimelong Group reportedly welcomed 30 million visitors to its parks in a single day. The TRAFFIC study and other undercover investigations in China demonstrate that shows featuring animal performances are indeed widespread, but not necessarily that zoo and circus owners are acting in knowing disregard of international trafficking laws. Chinese importers are probably complicit, but even they could, theoretically, be ignorant of breaking the law because falsification of records has only been proven on the African end of the supply chain. Chinese and Thai officials did not respond to requests for comment for this story. Young great apes are initially traumatized when captured in Africa, then again by being trafficked (often without adequate food or care) to Asia. They are subsequently housed at zoos, circuses and animal parks in reportedly appalling conditions — deprived of proper attention, affection, and the company of other apes, something that is required for healthy development among these social species. Severe training regimens only compound the trauma. Great apes taken from the wild as infants are exceptionally vulnerable. And their first year of life is critical to their healthy development, explains Stephen Ross, Director of the Lester E. Fisher Center for the Study and Conservation of Apes at the Lincoln Park Zoo in Chicago. Asian animal attraction trainers typically break-in young chimpanzees and orangutans at just several months of age as photo props, reports Stiles. The animals are made to appear with visitors for a fee. Then, as the primates age, they’re trained to perform in shows that feature unnatural tricks ranging from faux-boxing matches to dance circles. Chimpanzees are social learners, explains Gallucci, so young chimps in captivity often mimic their keepers’ behaviors. 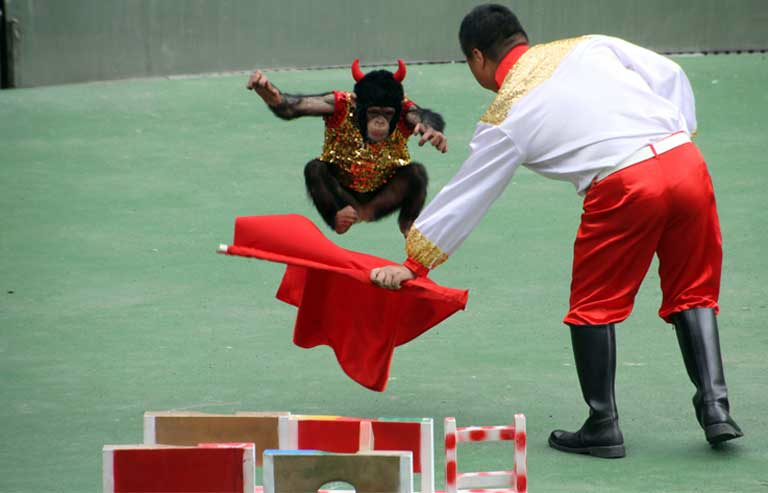 However, Gallucci and Ross both believe that the training required for choreographed primate shows almost always requires animal abuse. Ross has extensively studied captive chimpanzee behavior, comparing that of chimps kept as pets or performers in early years against behaviors exhibited by animals that have had greater exposure to other chimpanzees while young. He found that adult chimps reared by people, and with limited exposure to other apes, are less extroverted as adults — even after years of enjoying improved conditions, like those offered by sanctuaries. This tendency toward introversion disrupts the animal’s ability to properly socialize with other chimpanzees. The resulting loss of wild tendencies means there is zero chance of these primates ever being safely returned to the wild. As importantly, Ross also discovered a major difference between how audiences perceive performance animals and their wild counterparts — with familiarity leading to a diminished belief in the urgency for conservation. In one study, researchers found that audiences who often saw chimps in commercials and on TV automatically assumed that these “common” animals were more numerous and less endangered than other great ape species. It seems likely that if Asian show-goers make the same leap in logic, they will struggle to understand the need for great ape conservation or to perceive the detrimental effects animal attractions have on captive primates. As apes grow older, they become less desirable to their masters. Adult primates are more difficult to control, not to mention stronger, which makes them more dangerous to the public and keepers. Adult chimpanzees are particularly hazardous: in 2009, a pet chimpanzee living in Connecticut attacked a friend of its owner, nearly killing her. (The event helped shift American attitudes away from the desirability of keeping pet chimps). Photojournalist and investigator Karl Ammann contends that Asia’s performing apes are often “retired” to tiny, solitary cages; others, he says, simply disappear. The lucky ones spend the remainder of their lives in animal sanctuaries. Great ape trafficking is believed to be vastly underreported, and its usually illegal nature makes it difficult to quantify. In a 2013 report, Stolen Apes, the United Nations Environment Program (UNEP) identified 1,808 great apes taken from the wild illegally between 2005-2011, but those were only documented cases. Far more surely entered the black market without a trace; likewise, multiple studies show that more animals die during the hunt or in transit than are ever confiscated. In its report, TRAFFIC notes that, “the number of apes that appear in trade is thought to be far smaller than the quantity that die in the process of capture and transit and with the final consumer.” Hard data is difficult to come by, but TRAFFIC asserts that deaths occur at every stage of the chain, from capture to transit to arrival with the ultimate buyer. The UNEP report echoes these points, stating, “It is likely that these numbers are in fact a gross underestimation of the real impact of the illegal trade.” To improve monitoring, UNEP urges governments and NGOs to work together to keep and share records. When it comes to wild-caught chimpanzees, their intimate social organization means that a large number of adults are killed for every infant that is captured. A BBC investigation discovered that 10 adult chimpanzees are typically killed when one infant is snatched from the wild. UNEP concluded that up to 15 great apes die for every individual that enters the illegal trade. Adults are typically shot and processed as bushmeat for local consumption, or their meat is shipped to urban cities, and possibly as far away as Europe. Adult skulls and body parts are also sold and transported via the illicit supply chain. Great ape trafficking is a worsening problem in countries like Cameroon, as human activity expands into great ape habitats via logging roads, and as more forests are converted to oil palm plantations and clear cut for other uses in Africa and Southeast Asia. As opportunities for encountering and taking animals from the wild rise, so does the likelihood that impoverished hunters as well as sophisticated, often heavily armed, poachers will seek out great apes for capture and sale to criminal trafficking networks. UNEP estimates that the illegal trade may have removed as many as 22,218 great apes from the wild between 2005-2011. An estimated 64 percent were chimpanzees, whereas 56 percent of great apes seized by authorities were orangutans. Chimpanzees, with whom we share 98 percent of our DNA, are Endangered, with a global population as low as 150,000 animals, according to the World Wildlife Fund (WWF). Orangutans are faring worse: they are Critically Endangered, and WWF estimates that just under 120,000 remain in the wild. However, Orangutan Foundation International points out that actual numbers could be considerably lower. Worryingly, UNEP believes that the great ape trade is continuing to grow, to the obvious detriment of wild populations. Some of that growth is fueled by the high demand for young primates as pets (often in the Middle East) or as performing animals in Asia. The Convention on International Trade in Endangered Species of Wild Fauna and Flora (CITES) is an international treaty that came into effect in 1975 to ensure that trade in wild plants and animals doesn’t negatively impact their survival. Currently, 183 countries are signatories; all are required to enact domestic laws to bring the treaty into effect. In a 2014 report, law firm DLA Piper noted that, although all signatories have passed some type of legislation to meet CITES requirements, these national laws sometimes fall far short of what’s needed, contain legal loopholes, or are poorly enforced. Too often, arrests are few and far between. UNEP found, for example, that only 27 arrests were made in Africa and Asia between 2005-2011, over which time more than 1,800 great apes were documented as being illegally trafficked. Prosecutions are uncommon, and sentences are often insignificant, so fail to deter future criminal activity. As a result, the illegal wildlife trade is flourishing. It is now considered the fourth most valuable form of illicit trade (behind drugs, guns, and human trafficking), per DLA Piper’s report. As with a range of species, it is important to note that some of the great ape trade occurs legally. Species protected by CITES are listed on three appendices — I, II, and II. Appendix I covers species threatened with extinction, specimens which can’t be traded internationally unless imported for non-commercial purposes. Species that could become extinct in the absence of closely controlled trade are listed on Appendix II. Although all great ape species are listed on Appendix I, they can be legally traded as if they were on Appendix II if they were bred in captivity at facilities registered with CITES. But traders often game the CITES system, sometimes exporting great apes by falsifying permits — claiming the animals they’re selling were captive-bred when they were in fact wild caught. According to Ammann, widespread corruption makes falsification easy. Between 2009-2011, China imported most of its great apes from Guinea, using permits stating that all traded animals were captive-bred. Conservationists knew, however, that Guinea didn’t have any ape breeding facilities, so they asked CITES to intervene. In fact, “CITES has not registered any chimpanzee or orangutan breeding facilities for commercial purposes,” anywhere in the world explains Juan Carlos Vasquez, the chief of the organization’s legal and compliance unit. After conducting an investigation, CITES concluded that Guinea was falsifying permits to illegally export wild-caught apes. As a result, CITES suspended all commercial trade in CITES-listed species with Guinea in 2013, and the head of Guinea’s CITES Management Authority was subsequently arrested for fraudulently issuing permits (he was convicted but subsequently pardoned by the country’s President). China, at the other end of the Guinea chimpanzee supply chain, suffered no consequences for these violations, and authorities there insisted they were unaware that the imported animals were wild-caught. However, both Stiles and Ammann suspect China was complicit. Regardless, any legal action against China could only have been initiated by the Chinese themselves under their domestic laws, since the importation had already occurred. Like China, Thailand is a CITES signatory that has passed domestic conservation legislation, but Thai law doesn’t protect the great majority of non-native species. And when someone is caught possessing a legally protected animal or plant, the burden of proof is on the Thai state rather than the individual to show legal importation. According to TRAFFIC, Thailand is currently drafting new legislation that would, if passed, protect non-native species. During a January 2016 CITES Standing Committee meeting, the international organization encouraged all countries to eliminate loopholes of this kind. A range of individuals and organizations are developing and utilizing creative tactics to fight wildlife crime. There are new technologies under development — ranging from citizen reporting apps, to DNA testing kits for use in the field, as well as databases that track wildlife trafficking in real-time. New York University is working on an innovative web crawler that mines online web postings for animal and wildlife product sales. Stiles warns, however, that the crawler’s application may be limited since transactions involving live animals typically occur on social media platforms rather than websites. Social media has lately proven to be a prime way of connecting illegal great ape sellers with buyers, especially in the Middle East. In July 2015, the Wildlife Justice Commission (WJC) was quietly launched in The Hague. This non-profit seeks to “activate justice” by supporting national governments as they investigate and prosecute wildlife crime. When dialogue with national governments fails, the WJC can hold hearings in The Hague in which independent, impartial experts review cases of wildlife crime. Unlike other judicial bodies, however, such as the International Courts of Justice, Commission hearings are not legally binding. They do, however, shine a light on wildlife crime and provide recommendations for actions to curb it. The sobering reality: so long as there is public demand for boxing and dancing chimps, or photo ops available with orangutans in Asia, there will be poachers and traffickers willing to bear the legal risk of providing those animals, importers willing to forge documents to get great apes from abroad, and showmen willing to keep (and mistreat) them. If great apes are to be conserved, then the Asian public will need to come to the same conclusion as Americans — that these primates don’t belong on roller skates or in boxing rings; they belong in the wild.